Way back in probably the 1960’s the FBI developed a training pistol match which was soon used by civilian shooters and called the Combat Match. We shot a variant on this in the UK in the late ’60s. Later this became the source of PPC and the 1500 Match – and the Australian (and New Zealand) Service Pistol Match. Service Pistol comes to us from Australia, where it was first adopted as an Australian Nationals Championship event in 1977 and shot with pistols and revolvers in calibres from 9mm to .45. In 1982 they added Service Pistol Unrestricted to allow and encourage those with ISSF pistols of calibres down to 7.65 to compete. In 1989 as the interest in NRA Action Matches increased Pistol Australia introduced the holster draw into Service Pistol, leaving Service Pistol Unrestricted in its original form, being shot from the 45 degrees ready position. 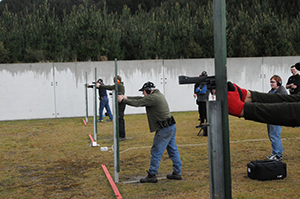 The course of fire consists of 90 shots fired at four distances from 50 down to 7 yards, and times between 2 minute 45 seconds for 24 shots to 4 seconds for 6 shots. 24 shots at 50 yards includes prone, sitting or kneeling and both left and right barricade. 36 shots are fired at 25 yards including more barricade and some standing clear of the barricade. 18 shots at 10 yards some of which must be fired strong and weak hand only. And the final series of 12 shots at 7 yards is almost the signature series of this match as it is done un-aimed, that is without raising the pistol above the shoulder. So, there is a brief description of Service Pistol. This tests your entire pistol shooting skills in a 90 shot match, and doesn’t need a fancy pistol. 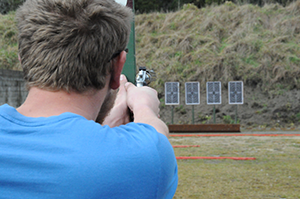 If your club isn’t currently shooting it then perhaps now is the time to give it a try. 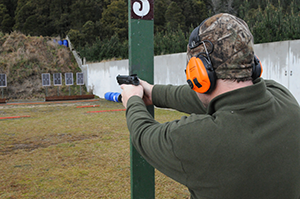 It’s one of the best all round tests of pistol shooting there is and the skills learned/honed can be transferred over into just about any of the other disciplines currently shot in NZ.